Our restaurant is a modern Indian restaurant which takes its inspiration from an age-old approach to dining. This approach allows you to choose a variety of appetizers and entrees to share with your dining companions. To make your dining experience better, our sommelier will be happy to pair appropriate beverages with your food selections. We thrive to make our restaurant the best Indian restaurant every day. Still Searching for Nearest Indian Restaurants? We try our best to provide you with the best quality of Indian food. We understand the complicacy that goes behind cooking different Indian cuisines. For this reason, we have cooks that specialise in various kinds of Indian Cuisines, be in Northern, Southern, Western or Eastern. We offer the most diverse, authentic menu of Indian food items. From samosas, pakoras and mulligatawny soup to chicken tikka masala, tandoori chicken, butter chicken and a range of vegetarian dishes, our menu is sure to satisfy the most discerning palate and Indian gourmand. Every meal at our restaurant is cooked with patience, love and authentic Indian spices. At our restaurant, along with the best Indian cuisine, you will also experience the unique culture of India. Following tool will help you to find best Indian restaurants near me. You can enjoy different dining venues including a showcase open kitchen where you can see our chefs cooking on the Tawa (griddle) and sigri (bar-b-que), a relaxing bar and lounge area, a community dining table, the main dining room or a private dining room. So, stop searching for the best or nearest restaurants to your place, just make the effort to travel to our restaurant. We guarantee that you will be nothing but satisfied after eating the best Indian dishes cooked with authentic and quality ingredients. All of our staff looks forward to welcoming you. India, the second most populated country in the world is also home to a rich cultural history. It is truly an ocean of civilization and history. The influences of hundreds of dynasties and thousands of kings are evident in the beliefs, art and traditions that exist in India. An integral part of this rich culture is its food. The overwhelming aroma of the spices, which is a mix of sweet and savoury smells flows through the air of India. India has one of the world’s most diverse cuisines. Indian cuisine is known for its large assortment of dishes and is characterized by the sophisticated use of many spices, vegetables, grains and fruits. Every geographical region of the Indian subcontinent consists of a wide variety of traditional dishes reflecting the variation in local culture and geographic location (proximity to the sea, the desert or the mountains). The only common thread that runs through most Indian food is the use of numerous spices to create the flavour and aroma. India’s history of invasions, numerous religious beliefs and cultural practices have played a major role in the evolution of its cuisine. Every well-known Indian dish is the product of a long history of invasion and the fusion of different food and traditions. The food habits and preferences of Indians have changed in stages over the last 4000 years, from the Indus Valley days through the Vedic times and after the influence of Buddhist and Jain thought, and their impact on the Dharma Sutras and Arthasastra of around 300 BC, to Mughals, Europeans and British. The food that Indians have been eating, over the millennia, has steadily evolved both in variety and taste. 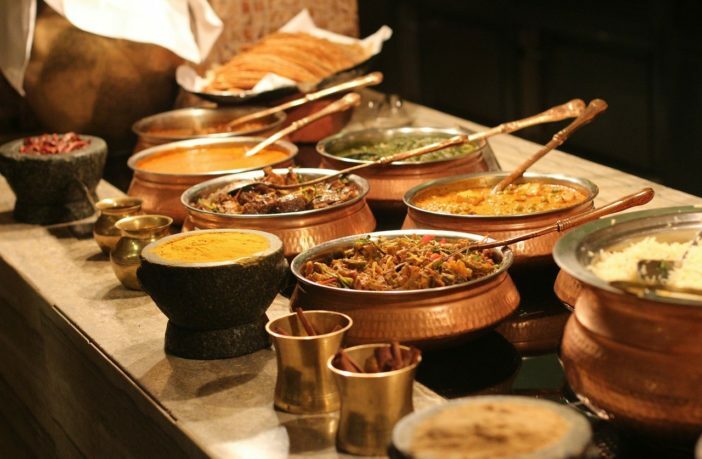 Indian cuisine is closely related to Indian history, with each historical period developing a unique set of dishes, using diverse ingredients. Besides being closely related to history, Indian food has also been strongly influenced by the Indian religion, cultural practices and the Indian people themselves. Hinduism and Islam are two dominant religions that have influenced Indian cooking and food habits the most. The Hindu vegetarian culture is widely practised. The Muslim tradition is the most dominant in the cooking of meats. It was during 7000 BCE, the prime years of the Indus valley civilization that humans developed proper cooking methods to prepare food. Sesame, eggplant and humped cattle had already been domesticated. Gradually, the cooking practices of this ancient civilization moved towards perfection. Many innovative recipes and better ways of cooking food emerged during the Vedic period. A regular diet during this period consisted of vegetables, fruits, grains, meat, dairy products and special kinds of spices. With the arrival of Aryans from Central Asia, a number of cuisines were introduced which complimented the Vedic dishes. Indian food further faced massive changes during the rule of Maurya and Gupta empires as the consumption of meat was strictly condemned due to sacred beliefs. This led some segments of the population to embrace vegetarianism. The medieval period further saw massive fundamental effects on Indian cooking. The Mughal Empire introduced fruits such as apricots, peaches, melons and plums and rich gravies and non-vegetarian dishes such as kebabs, giving birth to Mughlai cuisine. This Mughlai cuisine inspired the chefs in the kitchens of the Nizams, historic rulers of Hyderabad state, to experiment and resulted in the creation of Hyderabadi Biryani, a traditional meal made using mutton or goat meat, basmati rice, yoghurt and spices. The vegetarians of India were also inspired by the use of spices in Mughlai cuisines and gave birth to chaat, to make their food equally tangy and interesting. Next came the Portuguese who developed their own style of cooking with the most notable dish being Indian Vindaloo. This was followed by the Chinese, British and Anglo-Indian influences on Indian food. The British, for example, introduced tea or chai which is the favourite drink of most Indians today. In the last 5000 years, India has welcomed a multitude of settlers with a variety of belief systems. The Muslim sultans bought their architecture that still resides in India. The Farsi traders bought their silk and language to the streets of India. The Englishmen bought their culture in India. Regions and religions make up a large portion of the cultural fabric of India. With each dynasty and ruler, the food of India kept evolving and getting better. Indian cooking and food habits are a perfect blend of the ancient Hindu cooking techniques and the overwhelming use of spices by the Mughals. The Hindu vegetarian culture is widely practised. Muslim tradition is the most dominant in the cooking of meats. Mughlai food, kebab, korma are some of the wonderful contributions of the Muslim settlers in India. North, East, South and West are the four major regional styles in Indian cooking. North Indian food is highly influenced by the Mughal dynasty. In southern India, the cuisine is largely rice based with an emphasis on a thin soup called Rasam. Coconut is an important ingredient in most of the south Indian dishes. The western states of Gujarat, Maharashtra and Goa all have unique food experiences. East Indian cuisine is famous for its desserts, especially sweets such as Rosogulla, Chumchum, Cheena Poda and Kheeri. The proportionally high use of dairy products like milk, paneer, ghee and yoghurt is a distinguishing factor of North Indian cuisine. These products are most widely used in making the gravies. Other ingredients like chillies, saffron and nuts are also commonly used to prepare the dishes of the north. The cooking style of North India has adapted well to the changes bought in its cuisine over several years. It features the use of tawa (known as griddle in English) for baking roti (wheat-based bread) and a tandoor for baking other types of bread like naan and kulcha. A tawa is a small circular metal plate and a tandoor is a cylindrically shaped clay oven. Puri and bhatoora are some other types of north Indian bread that are deep fried and not baked. The staple food of North India is a variety of lentils, vegetables and roti. The variety and method of preparation changes from place to place but the aroma remains the same. Samosa is a popular snack that originated in North India. A common variety of samosa is filled with boiled, fried or mashed potatoes. It is now commonly found in other parts of the world like America and the Middle East. Other popular snacks and side dishes include chaat and several types of pickles. Popular sweets are called mithai and include several items like gulab jamun, ladoo, peda, petha, barfi, halwa and many more. East Indian cuisine is not just famous for its not too spicy food, but also famous for its delicious desserts. Sweets (also known mithai) like rasagolla, chumchum, Sandesh, rasabali, chhena poda, chhena gaja and kheeri originated in eastern India. Most of the sweets that are extremely popular in Northern India initially originated from here. The traditional food of Bengal is neither too spicy nor too faint in taste. Most common ingredients used in Bengali curries are mustard seeds, cumin seeds, black cumin, green chillies and cumin paste. Various types of curries can be found in Bengal. They are classified as bata (paste), bhaja (fries), chochchoree (less spicy vaporized curries) and jhol (thin spicy curries). These curries are eaten with plain boiled rice or spiced rice, known as ghonto. Fish is commonly consumed in the eastern parts of India, most especially in Bengal. The food of Bangladesh is very similar to that of Bengal due to the close proximity of the two places. A traditional Bengali breakfast includes boiled rice, doi-chirey and doodh-muree with fruits. Just like in South India, rice is the staple grain of Eastern India too. A regular meal may consist of many side dishes made of vegetables along with rice. The most popular vegetable dishes of Orissa are Dalma and Santula. Deep-fried, shallow-fried and mashed vegetables are also very popular here. A great emphasis on rice, the regular consumption of sambar (a vegetable stew based on a broth made with tamarind and toovar dal) and rasam (a soup prepared with tamarind juice or tomato, pepper and other spices), the liberal use of coconut and a variety of pickles is what makes South Indian food stand out. Dosa, idli, vada, bonda and bajji are South Indian favourites and are most commonly consumed as breakfast. The cuisine of Andhra, Chettinad, Tamil, Mangalore and Kerala, each have a distinct method of cooking and taste. Every South Indian state has a different way of preparing sambar. The sambar of Kerala will taste very different from the sambar of Tamil Nadu or the Sambar of Karnataka. Some other popular dishes include biryani, ghee rice, seafood (prawns, macherek and mussels) and paper thin pathiris from Malabar region. Hyderabadi biryani, a very popular type of biryani reflects the diversity of South Indian cuisine. Tamil cuisine is generally classified into six tastes: sweet (milk, butter, sweet cream, wheat, ghee (clarified butter), rice, honey); sour (limes and lemons, citrus fruits, yogurt, mango, tamarind); salty (salt or pickles); bitter (bitter gourd, greens of many kinds, turmeric, fenugreek); pungent (chili peppers, ginger, black pepper, clove, mustard) and astringent (beans, lentils, turmeric, vegetables like cauliflower and cabbage, cilantro). Traditional Tamil cuisine recommends that all of these six tastes should be included in each meal to provide a complete nutrition and balance the appetite and digestion. A typical South Indian meal is served on a banana leaf and includes steamed rice along with a variety of vegetable dishes. Meals are accompanied by crisp appalams. After a final round of rice and curds, a meal is concluded with a small banana and a few betel leaves and nuts. There are three major food groups in Western India: Maharashtrian, Gujarati and Goan. All three food groups have a very different taste and cooking style. Maharashtrian cuisine can further be of two types depending on the geographical circumstances. The coastal regions, geographically similar to Goa, consume more rice, coconut and fish. The is the hilly Western Ghats and the Deccan Plateau, groundnut is used in place of coconut and bajra is staple. Saraswat cuisine is an important part of coastal Konkani Indian cuisine. The food of Gujarat is predominantly vegetarian. Most Gujarati dishes have a hint of sweetness due to the use of sugar. A typical Gujarati meal consists of Rotli, daal, rice and a variety of different combinations of vegetables. Staples include homemade pickles and chaas (buttermilk). The cuisine of Goa is a mix of Hindu culture, Portuguese colonialism and modern techniques. Goan cuisine is mostly seafood based and the staple food of Goans is rice and fish.